Lifeasmom.com is a parenting website run by Jessica Ann Fisher, or FishMama as she refers to herself. The layout of the website is very simple with soft colors and drop down search boxes. FishMama makes it clear that ease of accessibility and simplicity are very important to the layout of her website. There is even a search bar, as well as links to her Facebook, Twitter, and YouTube accounts. The basic concept of the website is somewhat of a blog. FishMama shares bits and pieces of her life, and discusses what it’s like being a mom along with managing a home, a small business, and homeschooling. Her goal is to help other mothers be equipped in all the different areas of life with motherhood. She also hosts an “Ultimate Recipe Swap” on the website every Thursday. On Fridays you can check out the “Frugal Fridays” webpage where she posts about different ways to save money each week. There is even a store link where fans can purchase digital books. 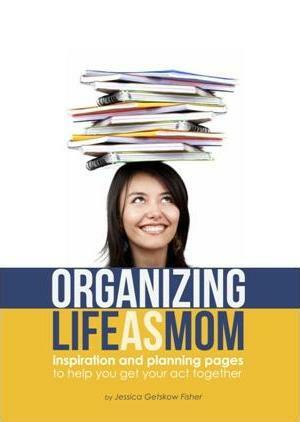 A book to help you organize your busy life! Cover designs by Joy A. Miller of FiveJsDesign. Some websites in competition with lifeasmom.com are suzyqhomemaker.com, allthingsfrugal.com, and ourbigearth.com. Lifeasmom.com is most similar to suzyqhomemaker.com; however, the website design of lifeasmom.com is much more professional looking, and there seems to be more content available. Allthingsfrugal.com also looks less professional, and lifeasmom.com offers more than just ways to save money. Ourbigearth.com is an online lifestyle magazine; however, it is more geared to family where lifeasmom.com is geared to mothers. One thing I would suggest to FishMama to help improve her website would be to make an online photo album link on the site. She seems to post a lot of photos of her family and traveling when she blogs, so why not organize them into fun photo albums for fans to enjoy. Overall I think her website is a great site for mothers to enjoy, learn, and swap ideas and recipes. ← CNN and Fox confuse everyone… even the president!